Marge Parsons, 78, of Richwood, died Wednesday, September 17, 2008 at Riverside Methodist Hospital. She was born October 16, 1929 in Eagleport, Ohio to the late James Alfred and Mary Louise (Robb) Hemry. She was a member of the Richwood First United Methodist Church, Mary Chapter 9 Order of the Eastern Star, Delta Kappa Gamma, Classy Red Hatters of Richwood, Retired Teachers Association and AARP. 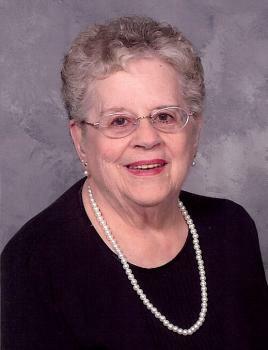 Marjorie was a 1950 graduate of Ohio University, after which she began her 30-year teaching career starting at Marysville Local School District, and finishing at North Union Local School District for the final 25 years. On June 10, 1950 she married Don Parsons, and he survives in Richwood. She is also survived by a daughter, Jean Ann (Craig) Hoffman, Westerville; a foster son, Harry Marvin, North Carolina; 5 grandchildren, Stephen, Chase and Kate Hoffman, John Eaches, Jan Belcher; and 2 great-grandchildren. She was preceded in death by foster-daughter Judy Daeger Shellenberg. Funeral Services will be held Sunday, September 21, 2008 at 2:00 PM in the Stofcheck-Ballinger Funeral Home, Richwood with Rev. David Redding officiating. Friends may call from 2 to 4 PM and 6 to 8 PM on Saturday at the funeral home where an Eastern Star service will be held at 6 PM. Memorial gifts may be made to the Richwood Park, in care of the funeral home. Condolences and remembrances may be expressed at www.stofcheck-ballingerfuneralhome.com. Dear U.Don & Jeanie, this is a very sad day for us, we do have beautiful memories too many to count....God Bless you, Aunt Marge - we'll always remember & Love You. Marge is a beautiful person who will never be forgotten. She will always have a special place in my heart. Love to Don and the family. You all are in my prayers. I am so sorry to hear about Mrs. Parsons....she was a great teacher who I will always remember. May God bless you. Marge was a devoted grandmother to Stephen, Chase and Kate Hoffman who will sadly miss her. Marge will be remembered by Donna and Steve Howell as one of the most kind and loving souls they have had the honor of knowing. May hope strengthen you . . .
May the light of God's love lead your way wherever life takes you. Sorrow is not forever. Love is! May you think lovingly of the past and hopefully of the future. My thoughts and prayers are near you, Don. May you be granted grace and strength for your every need. Keep smiling - may you always have a song in your heart. Back of the clouds the sun is always shining. God has prepared a rosy-tinted lining. Back of the clouds it's waiting to shine through. My sincerest condolences to Mrs. Parsons' family. She was the scariest school teacher I ever had but she taught my all time favorite subject, Ohio History. I am very sorry for her loss. Marge will be greatly missed by myself and others at McDaniels. Marge was a great woman, and I always enjoyed talking to her when she came in. I read her obituary with great sadness. I send my prayers and thoughts to Don and the rest of Marge's family and friends. We send our sincere condolences to Don and family on the loss of Marge. Don, you lost one of th best. Have fond memories of you and Marj, as teachers in Marysville, many, many years ago. So Sorry to hear of your loss. I will always remember Mrs. Parsons as a wonderful and caring teacher who only wanted the best for every student she taught. You are surely blessed to have had so many wonderful years together, and as a community we were blessed to know you both. Don, take care and know that there are others who are thinking of you in your time of sadness. We are so sorry for your loss. We always enjoyed visiting with you two when we were in Richwood. Marge was always such a positive person and a wonderful teacher. I am sure that Mom and Dad Wurtsbaugh were there to welcome her into heaven. You are in our thoughts and prayers. We were so shocked to hear the tragic news! You are in our hearts & prayers. I'm so grateful for the chance we had to visit with you, I can still see Aunt Marge smiling & laughing! The love, devotion & partnership you two shared will last forever in all of our memories and in our hearts. Our love to you all & we'll see you soon. We are in Logansport, Indiana and Pat is reminiscing with classmates from the Class of 1953. We are unable to be with you on Sunday to celebrate Margi's life but we will be with you in spirit. Don, we will be heading down your way probably on Tuesday. We'll give you a call and try to stop to see you. #18 Private Log in to view. Marge has always been one of my favorite role models. She always had a big smile and warm embrace for me, even if I hadn't seen her in years. I will cherish the memories and recipes that she has given me. God sure has a true GEM in his hands now. I look forward to seeing her again when I make the journey. My love to the family. I am so sorry about Mrs. Parsons. I had her and Don as teachers in school. I also stay in contact with them for many years. She will be sadly missed. Please accept our sympathy in the passing of Marge. I had the pleasure of working with Marge and you many times during the years our kids went to school at North Union, again our sincere sympathy. Our hearts go out to you in this time of sadness and loss. You and Marge were a great team. Please accept our deepest sympathy.